If you've just set a date for your wedding, this can be an exciting time for the two of you. Don't let the marriage license laws of Pennsylvania put a dent in your wedding plans. Here's what you need to know and what documents to bring with you before you apply for a Pennsylvania marriage license. We recommend getting this legal aspect of your wedding out of the way about a month before your wedding date. Requirements may vary as each county in Pennsylvania could have their own requirements. You will need to present photo identification such as your driver's license, state ID, or passport. Social Security numbers will be requested. You do not have to be a resident of Pennsylvania. Some counties may require that you both speak English or bring with you someone who can translate. 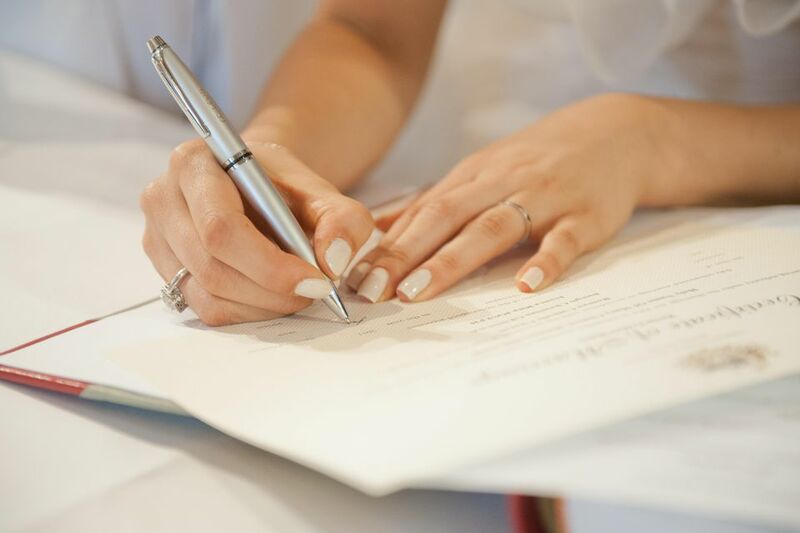 You will need to show a certified copy of the final divorce decree, with court raised seal, of your divorce or annulment decree or know the date of death of a deceased spouse. If you have resumed your maiden name, related documents must be shown. Foreign documents must be translated into English. There's a three (3) day waiting period in Pennsylvania. You can request a waiver of the waiting period. Send a letter as early as possible addressed to the County Register, requesting a waiver and your reason why. Your letter should contain both names, a telephone number, proof of your wedding date (a wedding invitation will work), and a return address so a letter of confirmation can be sent to you. There is an additional $15.00 fee in cash only for this service. It will cost you approximately $40 to $75 to get married in Pennsylvania and fees must be paid in cash. Please verify with the County Register the cost of a marriage license in the county where you want to get married. Additional surcharges have been added to the basic cost of a marriage license. No, you may not marry your first cousin. See Pennsylvania Statutes, Title 23, Chapter 13, § 1304, section (e) for more information. No, but your ​common-law marriage will be recognized in Pennsylvania if it was created before January 1, 2005. Yes, as of May 2014. If either of you is under 18 years of age, you must pay an additional $5.00, show your Birth Certificate, and have the written consent of a parent or guardian. Anyone under 16 years of age needs parental consent and the approval of a Judge of the Orphans Court. Note: A marriage performed by a minister ordained via the Internet was declared invalid because the minister did not have a congregation. If you want this type of license, you need to inform the clerk before you begin the application process. A Pennsylvania marriage license is valid for sixty (60) days. What this means is you two have 60 days to get married and have your marriage license officially recorded. If you wait past that time frame, you can't get married without applying for and paying for another marriage license. For marriage records, you will need to contact the Marriage License Clerk, County Court House in the county where the license was issued.